This short movie by Louis Feuillade is included as a bonus with the release of Fantômas by Kino. It represents one of his “Life as It Is” movies, which were early attempts at film realism, as defined by one of his manifestos on film. 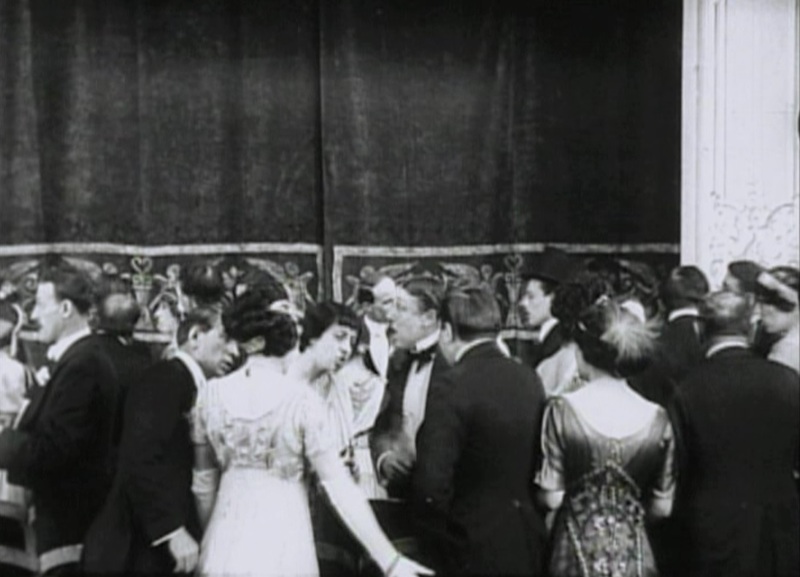 The movie begins with several Intertitles, which explain to us that a new play, “The Virgin of Corinth,” has become a tremendous critical and popular hit, and at its performance, when the audience calls for the author, the management displays a card explaining that the script was submitted anonymously, and that no one knows the author by face or by name. The next morning, we see the beautiful star of the piece (Suzanne Grandais) arise and read all the positive notices about herself and the mysterious writer. Then, we see another person (Delphin, whose name means “dolphin”) reading the same reviews: but he is a man of perhaps only four feet in height. He lives with his mother (Renée Carl), and dreams of his love for Suzanne, but he knows she would reject him. Suddenly, he gets an inspiration to use the high technology of the telephone to call her. If she only hears his voice, she will fall in love with his words, and perhaps someday overcome her reaction to his true size. He calls her, she is thrilled to receive a call from so talented an artist, and the moreso since he maintains anonymity in the world. We see a group of (female) telephone operators listening in on the call – to judge by their faces, it gets pretty hot. Suzanne has connections, however, and is able to discover the address of her mysterious caller. She goes to visit him, and meets his mother. Renée tells her son of his visitor, and he swallows his fears and goes out to meet her. The response, of course, is crushing. Suzanne laughs at him openly, and at herself for being so easily fooled. Renée tells her to leave, and tries to console her son, knowing that a mother’s love is no substitute for the love he has lost. While the movie is largely typical in style for its time, there are some interesting aspects to it. Perhaps the most exciting for me was the use of a split screen to demonstrate the telephone call – a tactic that remains in use today. Feuillade handles it by dividing the screen into three segments: with Delphin on one side and Suzanne (in her bed – racy stuff!) on the other. In the middle is a shot of the Champs-Élysées facing toward the Arc de Triomph, seeming to signify that “Paris” stands between the two telephone sweethearts. I’m not going to say that this is the “first” time a split screen was used to show a telephone call – quite possibly I’ve seen other examples already – but it is a very interesting use of the concept, and seemingly original to Feuillade. Apart from this is the very fact that the little person is used not for comedy or to emphasize his “strangeness” as in a freak show, but with sympathy and as a tragic figure, a brilliant artist trapped inside a body that the world cannot appreciate. Even in much later years, shorter actors would still be playing monsters and clowns rather than protagonists of serious story lines. Finally, I found it amusing that the cliché of the snoopy telephone operator had been established so soon after the introduction of telephone technology. I think this is one of the better “Life as It Is” movies that I’ve seen from Feuillade, and I’m glad it was included on the disc, reminding audiences that he did much more than crime serials. You can watch it (in two parts) here and here.